The Crown Casino Melbourne isnt a particularly "Melbourne" attraction, but rather embodies everything extravagant and over the top. You could actually miss the whole Melbourne experience if you just stayed there. Nevertheless, it is a massive jigsaw of entertainment, leisure and luxury - with towering ceilings, impressive staircases and water features, and the largest casino in Australia. Many tourists and locals find the complex an interesting place to wander through and experience. It is located on the picturesque Southbank promenade along the Yarra. The landmark Crown Tower has one of the best views of the Melbourne skyline. There is a Melbourne Morning tour that takes you on a short visit to the crown - for an idea what you might want to go back to. There is always something on at the Crown complex, such as concerts and live shows by often internationally known artists and performers. Their venues include a large ballroom. They are stylish and lavishly over the top. The Atrium is set out in black marble, with a crystal ceiling, water features, light effects and laser shows. The Village cinemas are also part of the Crown Casino Melbourne, with first class luxury viewing options. There is a Kingpin bowling alley, as well as an indoor theme park. And of course the gaming venues where you can easily leave your money. There are over half a kilometre of gaming floors with more than 300 table games - such as poker, blackjack and roulette - and pokies. There is also regular free live entertainment in many of the bars and restaurants. Outside, on the Yarra foreshore a row of chimneystacks spit fire every hour after dark in a powerful display of the elements. You can also go shopping at the Crown, where you'll find luxury brands as wells as leading designer and fashion brands and other luxury articles. The Crown Casino Melbourne complex has a staggering number of premium and casual dining options, as well as bars and a couple of nightclubs. There are ambient footpath restaurants along the Southbank promenade from where you can watch the people stroll by in front of the picturesque Melbourne skyline. There is also a food court providing tastes from around the world. You could stay around the Crown for weeks and still eat in different places. But don't forget, that you haven't actually experienced Melbourne yet! Staying at the Crown will give you ambience and style, great views and more space and quiet than you would get in the streets around the hotels in the city. You have the choice between the luxurious Crown Towers, the Crown Promenade Hotel and the Crown Metropol. The Crown Towers is a lavish and opulent 5 star luxury hotel with oversized guest rooms overlooking the city and Port Phillip Bay. This is where Tom Cruise and Katie Holmes and Kerry Packer have stayed. 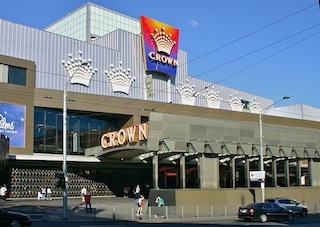 The Crown Promenade Hotel is located behind the Crown Casino Complex and is linked via an airbridge. It is a modern spacious 4 ½ star hotel. The Crown Metropol is a stylish modern 5 star hotel with spectacular views over the city and bay. 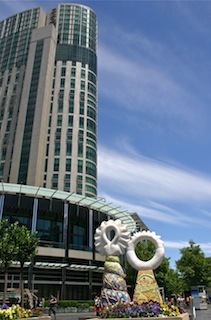 It is located next to the Crown Entertainment complex and also connected to the Crown complex.